It is important to remember that Federal, state and local government agencies do not allow ground water or rainwater to enter sanitary sewer lines. 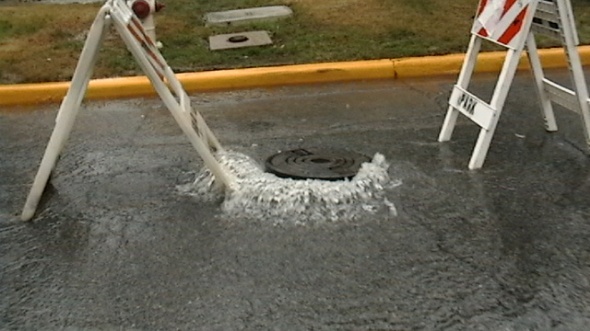 All rainwater runoffs must be connected to storm sewer mains which are designed for this purpose only. Sanitary sewers collect and convey wastewater (showers, kitchens, washers, bathrooms, sinks, etc.) to a sewage treatment plant. It is important to understand that sanitary sewer lines are a completely different set of pipes from “storm drains.” Sanitary sewers have limited capacities and are not designed to dispose of stormwater (i.e. rainwater) from private property. In Highland Park, an independent system of pipes called “storm drains” is used to transport only stormwater (i.e. rainwater) to creeks with no treatment. The inlets along roadways have been constructed to receive the rainwater. All storm sewer inlets ultimately enter natural water sources (Turtle Creek, Hackberry Creek). The Town’s program has and continues to reduce number, frequency, and volume of sewer overflows. We are here to help. Just give us a call at 214-521-4161, and we will be glad to do a free inspection.